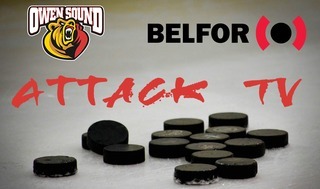 The Owen Sound Attack and Sault Ste. Marie Greyhounds are trading barbs in their Western Conference Semifinal Series. Wins by the Attack in Games 1 and 3 of the tilt have been parried by Hounds victories in Games 2 and 4, with Wednesday night’s Game 4 ending in a 5-2 victory for the visitors. The teams will now be forced to return to the Bayshore on Sunday, Apr. 15 for Game 6, which will begin at 7:00pm on Sunday evening. A furiously paced opening period saw both teams trade chances at either end of the ice in a frame that looked like it would only need 20 minutes of real time to play. But then penalties to the Attack killed the flow and put the Bears on the defensive. Minors just 33 seconds apart to Brett McKenzie and Markus Phillips put the Attack on their heels, but 1:27 of hard work heard the Bayshore faithful erupt in applause, swinging the momentum back in Owen Sound’s favour. Just seconds after the Bears were back at even strength, they got their first man advantage of the evening but were ultimately unable to capitalize either. That opened up a chance for the Hounds to strike first, which they did when Boris Katchouk kicked a rebound up to himself before tucking it past Lafreniere with 5:23 left in the opening period. No other goals were to be scored in the 1st, but the ice was hardly dry in the middle stanza when the scoreboard changed again. Just 60 seconds into the frame, Taylor Raddysh squeaked a shot through the wickets of Lafreniere to put his side up by a pair before there was any response by Owen Sound. That’s when the team’s powerplay made good on a set faceoff play, with Kevin Hancock blasting a little touch-pass one-timer from Nick Suzuki into the back of the net, generating an ear piercing bout of cheering by the crowd. That goal held until the final frame, when a comeback attempt by the Attack gained some legs. Ethan Szypula brought the Bayshore to life again with 9:35 gone in the 3rd period, jamming home a net front scramble to blow the roof off the place and make it a 3-2 hockey game on assists from Jackson Doherty and Aidan Dudas. But the Hounds were determined not to let the Attack get any closer, and with 7:58 remaining in regulation, the Soo won a faceoff in the Attack zone and before anyone could react, Keeghan Howdeshell had fired his 2nd of the night past Lafreniere to make it a 4-2 Greyhounds’ lead. That goal would stand as the game winner, and Sault Ste. Marie would add a Connor Timmins empty netter with 1:22 to play in regulation to cap off what was a 5-2 victory. Alan Lyszczarczyk was named the Hatten Home Building Centre Hardest Working Player of the Game for his efforts on the evening, while his teammate Sean Durzi was named the Mac Taylor Corporation 2nd Star of the Game. Sault Ste. Marie’s Keeghan Howdeshell was named the game’s 1st Star, while Mac Hollowell rounded out the post game awards. The Mark McDade Chestnut Park Shots on Goal finished at 41-39 for the Soo on the evening. 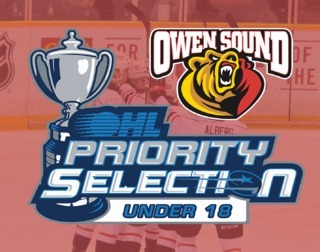 Also on Wednesday night was the Ontario Hockey League’s 2nd annual U18 Priority Selection where OHL member Teams draft players out of Major Midget programs. Picking 15th overall in the 1st round, the Attack selected centreman Griffin Wilson out of the Huron-Perth Lakers Major Midget program. In 33 games for the Lakers, the 6’3, 209lbs Wilson scored 14 goals and chipped in with 15 helpers. He also saw seven games of action as an AP with the Stratford Warriors of the GOJHL. In the 2nd round of the draft, the Attack selected at 35th overall and used their choice to draft Ayden Letang of the Lambton Jr. Sting. A left winger, Letang stands at 6’0, weights 188lbs, and in 31 games with Lambton he registered two goals, five assists and 65 penalty minutes. Also played five games of Junior C action with the Wallaceburg Lakers, scoring once and assisting on another to go along with 14 minutes in penalties. Owen Sound and Sault Ste. Marie will now head back to the Essar Centre for Game 5 of the series, a 7:07pm start on Friday, Apr. 13. 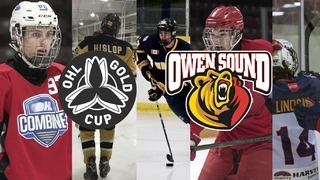 Fans can watch the game live on Rogers Local 53, or tune into Fred Wallace’s call on Kia of Owen Sound/Terry’s Trailer Service Bear Radio on 560 CFOS. The teams will then return to the Bayshore for a potentially decisive Game 6 at 7:00pm on Sunday, Apr. 15. 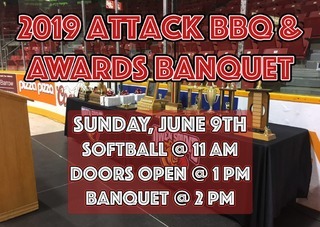 Tickets will be available for purchase at the MacVicar & McComb ReMax Attack Box Office, online at www.attackhockey.com, or by calling 519-371-7452 at 1:00pm on Thursday, Apr. 12. Season Ticket Holders will have until 1:00pm on Friday, Apr. 13 to claim their seats before they are released for sale to the general public. This season of Attack Hockey is presented by Lerners Personal Injury Lawyers and Bertrand & Muzzell Paralegal Services.